An underactive thyroid is the source of a variety of health issues related primarily to slow metabolism. Fatigue, weight gain, muscle aches, sensitivity to cold, difficulty falling and remaining asleep, constipation, mental fog, problems concentrating and a variety of other symptoms are common in hypothyroidism. 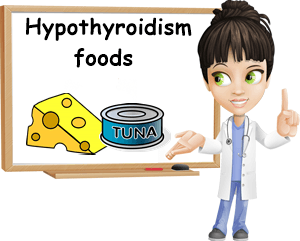 Considering the condition is, for the most part, caused by a severe and prolonged iodine deficiency, correcting the deficit by eating foods rich in iodine can dramatically help improve hypothyroidism. Thyroid health is also highly dependent on a sufficient intake of another dietary nutrient called selenium. The dietary mineral has been found to play a significant part in thyroid function by supporting the production of thyroid hormone. While its role may not outrival that of iodine, it nonetheless remains essential for the health of the organ, moreso when emerging research indicates it may help hypothyroidism caused by autoimmune factors. Both iodine and selenium are essential for normal thyroid function and studies suggest that correcting deficiencies is the first step towards treating hypothyroidism caused by an insufficient intake of the two nutrients. It has been estimated that an average adult needs about 150 mcg of iodine a day and about 55 mcg of selenium to enjoy a good overall health, thyroid health included. 1) Kelp. Iodine is a mineral found naturally in the soil and seawater in varying amounts. Edible sea plants such as seaweed, fish and shellfish (seafood) are generally the richest sources of the nutrient. Kelp is a type of larger seaweed and one of the best food sources of iodine, despite having varying amounts of the nutrient. Approximately 1 g of kelp can have anywhere from 15 mcg of iodine (very little) to 3,000 mcg (a lot), but is generally an extremely rich source (Variability of iodine content in common commercially available edible seaweeds). This makes it ideal for use as a dietary supplement rather than food source. However, it is important to keep in mind that not anyone can eat seafood (some people are allergic to seafood). Moreover, considering kelp may contain significant amounts of iodine, it is recommended to limit consumption to avoid an excess that can disrupt normal thyroid function and lead to hyperthyroidism. To put things into perspective, it can have so much iodine it can easily provide 20 times the recommended daily intake in as little as 1 gram. If you are thinking about correcting your iodine deficiency and underactive thyroid with kelp supplements, it might be best to consult with your doctor first to learn how much iodine you actually need to prevent an excess that put the thyroid into overdrive. 2) Saltwater fish: cod, tuna, salmon. Cod is estimated to contain around 99 mcg of iodine per serving (around 85 g), which would mean it supplies over half of the recommended daily allowance of the nutrient. Being an easily available source of the mineral, regular consumption of codfish can be helpful in cases of hypothyroidism, contributing to meeting daily allowances. However, keep in mind that it is possible for iodine content to differ slightly in the same species, depending on whether or not the fish is farmed, what its primary food sources are, how it’s prepared for consumption etc. Tuna and salmon are good options too. Approximately 85 g of tuna canned in oil provides about 11% of the recommended daily intake of iodine. The same amount of tuna provides anywhere from 32 to 110 mcg of selenium (depending on variety and cooking method employed), making it essential for thyroid health. Salmon is also a good source of iodine (although the fish are born in fresh water, they migrate to the sea where they have access to iodine from seawater and marine plants, becoming themselves a source of the nutrient). Moreover, it contains an average of 30 mcg of selenium per serving of 85 g (more than half of the daily recommended intake). 3) Dairy products: cheese. Generally, most cheese products are prepared with salt to preserve them better, adding to the iodine content of the final product. Considering that salt in general is iodized, this makes cheese a good source of iodine and helpful for hypothyroidism. However, intake should be limited as excessive amounts of salt are not healthy. Cheddar cheese, for example, is a good source of both iodine and selenium. Cottage cheese, mozzarella, parmesan and ricotta are also good sources of selenium and good options for an underactive thyroid. 4) Dairy products: yogurt. It is estimated that a cup (about 245 g) of plain, low-fat yogurt provides around 50% of the recommended intake of iodine and about 11% of the recommended intake of selenium, which makes it a great option for anyone suffering from hypothyroidism. 5) Milk. Low-fat milk can supply more than 35% of the daily dose of iodine per cup (about 245 g) and somewhere between 11% to 15% of the daily requirements of selenium (depending on the brand) for the same amount. 6) Shellfish. Oysters, mussels, clams, scallops, shrimp, crabs, lobster and other marine shellfish are particularly rich in iodine and thus helpful for correcting thyroid deficiencies. For example, 85 g of shrimp can supply over 23% of the recommended daily allowance of iodine and over 55% of that of selenium. The downside is that shellfish is not an easily available source of the two nutrients as it is often expensive and not everyone can afford it. Moreover, certain people may be allergic to seafood and it is possible for differences in nutrient content to appear within the same species. 7) Eggs. The egg is an almost ideal food with the advantage that it is readily available and overall affordable. One large egg (about 135 g) is enough to supply us with 15% of our daily allowance of iodine and an average of 22% of selenium. 8) Brazil nuts. Brazil nuts do not stand out for their iodine content, but rather for their amazing content of selenium: one 133 g cup of dried nuts contains roughly 2549 mcg of selenium. While it is a great food for managing a selenium deficiency, the Brazil nut is not something you eat on a daily basis. Too much selenium can have serious health consequences and even 3 g of this nut variety can supply an average adult with all the selenium he or she needs for an entire day. Moreover, there is the concern of the natural radioactivity level of Brazil nuts which may have long-term impacts on one’s health. If selenium is what you seek, there are other good sources in the form of cashews, sunflower seeds, sesame seeds or pumpkin seeds. 9) Chicken. On average, chicken meat is a good source of selenium, not to mention an affordable food for most people. The meat has anywhere from 14 to 40 mcg of selenium per 85 to 140 g, while giblets are an even richer source with 152 mcg per 140 g.
These 9 food sources are great options for anyone dealing with hypothyroidism and its effects, but also good for healthy individuals who need to maintain their daily intake of iodine and selenium. However, it is important to remember that iodine and selenium content may be different within the same food. Different cooking techniques, differences in soil content and several other factors may influence the final content of the nutrients in food. Moreover, considering the sensitive nature of hypothyroidism, it is always wise to talk to your doctor in advance about any action you wish to pursue in view of managing the condition. Too little or too much iodine, for example, can have a deep impact on thryoid health, resulting in either an underactive or an overactive thyroid. Because both conditions come with their own set of unsettling symptoms and health issues, it is important to tread carefully on the path to recovery and consider all aspects of your decisions in order to minimize potential side effects and reduce health risks.